1. Online. This format is ideal for whilst you are using the DMS on your computer, laptop or mobile device. It produces the data in a logical format that can not be printed and folded into a handbook, but can be saved to your device for paper-less access to it from time to time (remember it is version controlled by the date it was last produced though!). 2. Print. This PDF format is ideal for home printing so that you can produce a physical handbook. It is not meant for online viewing as it will need to be folded into shape to produce a physical handbook. 3. RTF. RTF stands for Rich Text Format. This is ideal for any Rotarians using either a PC or Mac who want to download a version of the handbook that can be edited using your word processor. You will need to be careful not to add/remove too much data though as it will affect the way it prints. In order to print the PDF files you will need to have appropriate software installed on your computer. Most computers will already have a copy of Adobe Reader installed for this purpose and will open PDF files automatically. If your computer does not have suitable software installed, or if you wish to make sure you have the latest version, please visit www.adobe.com for more information. Adobe Reader is free software and is easily available from the front page of their site. If you are already using Adobe Reader then we suggest that you upgrade to the latest version. 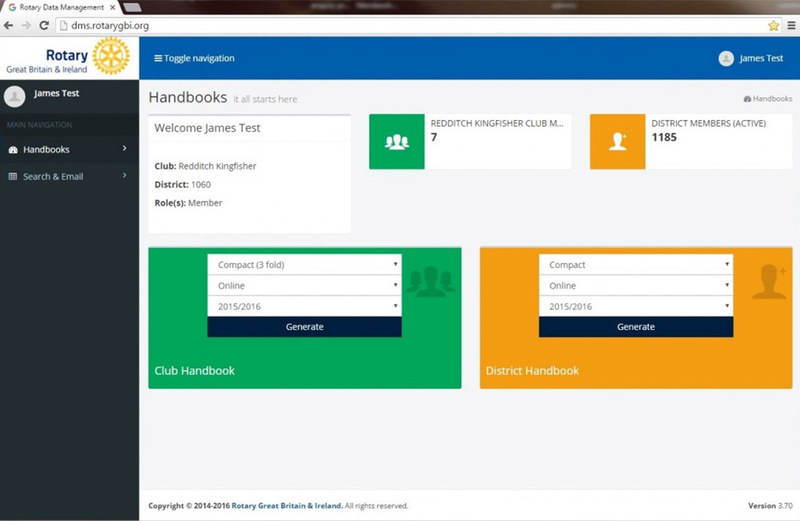 You are also able to produce handbooks for two different Rotary years based upon the data you have entered into the system. The current Rotary year, and the forthcoming Rotary year. This will automatically update on the 1st of July every year. This is normally printed on a single sheet of A4 with the club information, Four way test, Objects of Rotary and club officers on one side and a full list of member contact details and classification on the rear. The 4 fold version includes a notes page. This produces an A5 handbook containing club information, RI and RIBI President details, club officers, club committees, past presidents and a full list of member contact details and classification. As per the standard handbook with the addition of the club programme. As per the standard handbook with the addition of the member’s photo. This produces an A5 handbook containing the district officers, all club secretaries in the district, Four way test, Attendance rules, Objects of Rotary and a list of clubs including their meeting information and club officers. As the compact handbook, with the additional information for each club of all members, their email address, telephone number and classification. As per the standard handbook, with member addresses included. This handbook is intended for two purposes – to be saved onto your computer as a PDF of the complete membership handbook and to be printed by a professional printer. It will produce a directory similar to the full printed directories printed in previous years in the district. As per the standard handbook, with the pictures for district officers and club secretaries.